historical Chattanooga newspapers are now online and searchable as open and freely accessible via the website chattanooganewspapers.org. Moon and Mr. Hall share a concern that Chattanooga’s papers remain largely inaccessible to a wider audience. 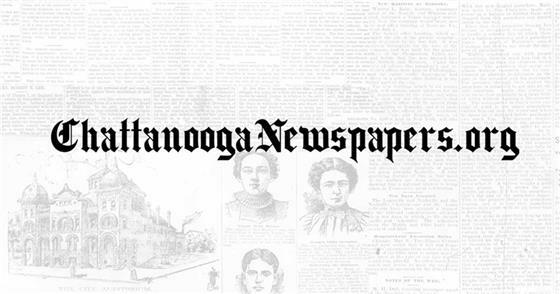 In 2016, the Tennessee State Library and Archives (TSLA) selected and provided reels of Chattanooga newspapers on microfilm from their collection to be digitized via a third party partner and coordinated by Mr. Hall. Since then, both history advocates have been proactively working to find affordable and sustainable options to bring newspapers online over the past four years. Advantage Preservation, an Iowa-based company was selected based on their dedicated to preserving history, while providing a standards-based process to host online-access. The company works with libraries, state and local historical societies, newspaper publishers, genealogical societies, museums, schools, colleges, and other institutions to preserve and provide access to their local history. The first 6,000+ digitized pages are just the beginning, and included content is from multiple publications that date from as early as 1838 through 1907. Donations from just 30 people made this possible. Mr. Moon and Mr. Hall are already making plans to expand the collection further.